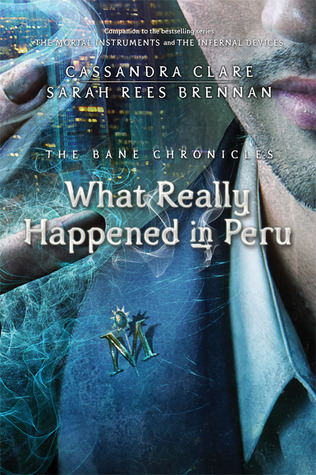 I'm so glad that Cassandra decided to write the Bane Chronicles. It's a great way for us (the fans) to get more in touch with the brilliant Magnus Bane. It makes it easier for us to understand why he is the way he is now. I'm happy that she decided to begin the Bane Chronicles with What Really Happened In Peru, because a lot of us are very curious as to why he was banned from Peru in the first place. So now, if you want you can read this and discover for yourself. This book has really told me more about Magnus. I already knew how much fun he was to have around so all the partying didn't surprise me. And I heard about the whole thing with the monkey before, and I'm glad I found it in here. I was wondering what book that monkey business was in. Some of the things the reader gets to know about Magnus aside for why he was banned from Peru is why he knows so many languages and what happened to his parents. Magnus's life truly fascinates me. I've never heard of Catarina before, but she's obviously a good friend of both Magnus and Ragnor. She fitted right in with them and was one of the reasons for those stories. The ending was quite a shock to me. I had not expected that to happen. I love his last little story. It was quite fun. But the very last paragraph explaining the reason for him being banned from Peru... A complete shock to me. Thanks Cassie for this brilliant series. Amazing idea! And I loved how it went from story to story saying "no this wasn't why, but maybe this was haha nevermind". This gets a 4/5, because even though it was such an amazing book I think that there are certain things that could've been done to improve it like how they met Catarina in the first place (which I would really like to know). Did this book meet my high expectations? All of Cassie's books do. Would I recommend this book and to who? Yes I would. To all of the Mortal Instruments fans. You should really read this if you liked the Mortal Instruments. Or even the Infernal Devices. This works along with those amazingly.